Routine vs exceptional cosmetic procedures: a helpful distinction? In this blog, Katharine Wright (Nuffield Council on Bioethics) reflects on the final Beauty Demands workshop, 'Routine Maintenance and Exceptional Procedures' and asks if it is possible to draw a coherent line between the two. One of the early challenges of the Nuffield Council’s Working Party on cosmetic procedures has been to define what it is we should include in the concept of ‘cosmetic procedures’. Is it really possible to draw clear and consistent dividing lines between medical procedures undertaken for cosmetic purposes as opposed to rehabilitative/therapeutic purposes? And, at the less invasive end of the spectrum, is it possible to draw coherent distinctions between everyday beauty routines and procedures that span the beauty/clinical divide, such as chemical peels, laser treatments and skin-whitening treatments? Or are these lines inherently porous and fluctuating? In this post, Professor Steve Garner (Birmingham City University) and Somia R Bibi (Warwick University) discuss their work on lightening practices and explain why this is an area which requires further research. 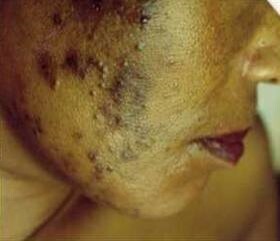 Skin-lightening (also known as skin-whitening, and skin-bleaching), is a global, multibillion pound industry. Both men and women lighten their skin, yet women are measured most against normative aesthetic standards, and remain the dominant market group for the sale of skin-lighteners. Starting with a British Academy Small Grant we are attempting to analyse skin-lightening practices and highlight the need for research within the UK. We began by trying to establish a base-line, using anonymous surveys, about what products women buy, where they are sourced and how they are used.